D is for drill, dovetail and discoidal. To be sure, all three artifact types are associated with the prehistoric archaeological record of Pennsylvania. As well, they are found in other regions of the continental United States and their morphologies differ greatly. These objects served a variety of functions and some are only found during certain periods in human prehistory. 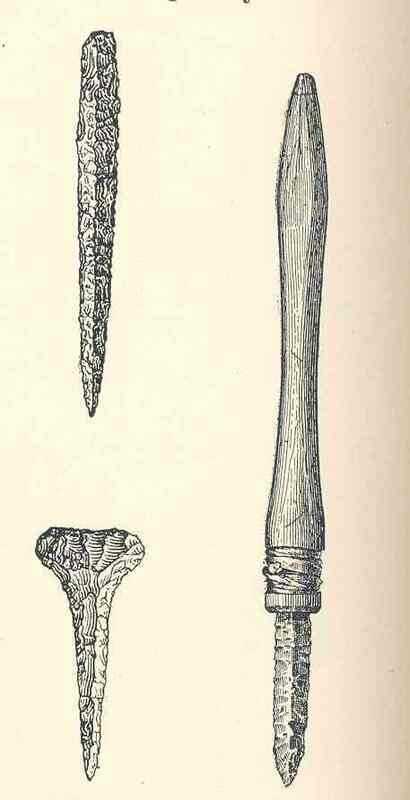 DRILL: Talk to any flintknapper or experimental archaeologist and they will tell you to successfully fashion a fragile six inch long stone drill takes much time, know-how and above all, a good deal of luck. Hence it is not surprising that most of the drills found in the Susquehanna and Delaware River Valleys dating to the Transitional period (ca. 3000-4000 BP) are broken. The wear patterns exhibited on these tools show striated and polished edges that are oriented perpendicular to the long axis of the bit. This wear occurs from drilling into a hardened surface such as a steatite bowl or slate pendent. However, some of the longer specimens do not show any wear patterns at all, suggesting some other function or a non-utilitarian role within this society. Some are obviously hafted and some are not. Hafting a drill is simply a matter of notching its basal end (the part opposite the tip). Drills without a hafting element were likely secured into bone or wooden handles thereby allowing for easier manipulation of the tool during the drilling process. Dovetail: In Pennsylvania, dovetail points and knives are commonly associated with the Middle Woodland Hopewell Period (ca.1500 – 2100 BP). These artifacts occur in burial mounds of the Squakie Hill Phase in western and northwestern Pennsylvania. 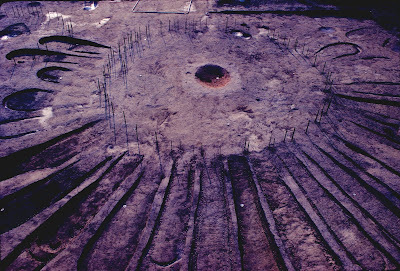 The associated habitation sites are rare and poorly known. Dovetail points and knives are usually carefully made from high quality cherts, jaspers and chalcedonies traded from quarry sites far from their places of discovery. This observation argues that some form of trade and exchange of goods was operating between groups of the Middle Woodland Period. In the mid-west this manifestation has been named the Hopewell Interaction Sphere. Since prehistoric cultures were never static, it is no wonder that dovetail points have been found on many sites in numerous geographical settings but their numbers are never great at any one site. Discoidals: Discoidals or chunky stones seem to appear at sites dating late in Pennsylvania prehistory. In southwestern Pennsylvania they are principally found on Late Prehistoric villages (1100- 500 BP) of the Monongahela Culture. Discoidal stones look much like a prehistoric hockey puck, although they were not used for that purpose! Instead they were used in the game of chunkey. This game allowed a person to hone their spear throwing skill by throwing a stick at a rolling chunkey stone, hoping to either knock over the stone or land their stick closest to where the stone stopped . A few specimens have a concavity on each of its flat sides that can end as a perforation in the center of the stone. Some discoidals are made from fine to medium coarse grained sandstones from local source outcrops. 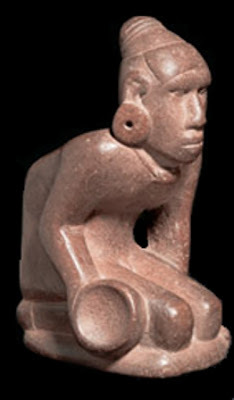 While the more elaborate examples generally found at Mississippian sites further west in the Ohio/Mississippivalley or in the south, are often made from more resistant stone such as granite. 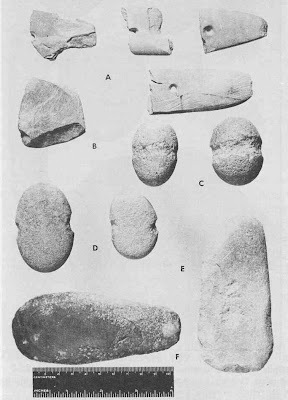 Examples of discoidal stones in the archaeological collections of The State Museum of Pennsylvania reveal some hint as to their method of manufacture. A discoidal starts out as tabular stone that has been roughly chipped into a disc-shape. The irregular rough edges are then ground down to create the final shape. 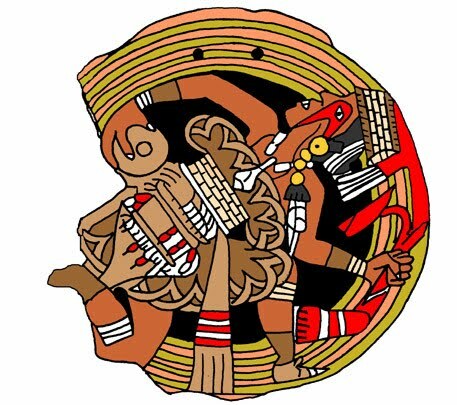 Engraved shell gorgets and pipe stones discovered at some Mississippian sites of the mid-West depict discoidals being used in contests whereby the individual is seen in a crouched posture ready to roll the discoidal along the ground. C is for curation, conservation, context, catalog, collection and the list goes on. The focus for the letter C this week is curation. Archaeological curation is defined as the process of managing and interpreting archaeological collections over the long term (Sullivan & Childs 2003). Often we have heard others refer to curation as “warehousing” of archaeological collections. Warehousing is putting something on a shelf and never looking at the contents of the box or crate again. It does not allow for the research which is routinely conducted on the collections at The State Museum or the loans to public facilities across the nation. Curation of archaeological collections involves the preservation of not only the artifacts, but also the documentation surrounding the recovery of these artifacts. This is what comprises an archaeological collection- the field records, field maps, journals and daily logs, photo documentation, any additional field documentation, artifacts and a complete professional report. 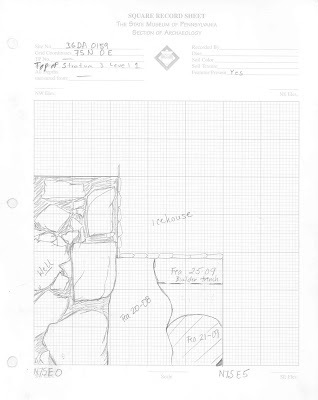 This square sheet drawn by archaeologists while excavating a site is used to document features and changes in the soil. Archaeologists excavate and map artifacts using an established grid. Excavation of archaeological sites is a destructive process, and therefore it must be a scientific process. Professional archaeologists painstakingly measure and record every square inch (or cm) of the site that they are destroying. They record this data using transits, tape measures, line levels, mapping squares, and grid sheets to name a few of the tools employed. Profiles of soil changes are produced; photographs of the excavation record the process and preserve what the eye is seeing. Archaeologists know that once they dig beneath the ground surface, that they have forever removed a portion of history contained in that landscape and that the preservation of maps and images are essential records. The history of that plot of ground is dependent on how well archaeologists document what they observe in those soils, and the careful recovery of the physical evidence of past inhabitants. Artifacts are the evidence left by those before us and serve as the physical connection to our past. Dr. Bernard Means examines a pottery vessel while conducting research on sites excavated under New Deal programs.. For more information on Bernard’s research visit our New Deal Archaeology web site. Curation of the documentation associated with archaeological investigations and the preservation of artifacts assists archaeologists in documenting and interpreting past human behavior. Researchers scour the documentation for information that facilitates our understanding of prehistory from how stone tools were produced and used, to the house sturctures of our early Native American population. This excavation of a house structure provides the archaeological evidence of this type of structure and improves our understanding of Native American prehistory. 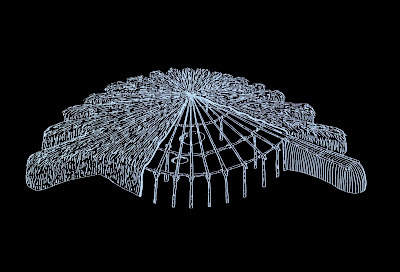 Artists drawing of house structure based on archaeological evidence. The historic record is often enhanced or corrected by our archaeological evidence recovered from our more recent past. History documents significant events or people, but archaeology provides a picture into the everyday life of peoples who are often left out of the historic record. Our past is our cultural heritage and the preservation of this heritage is facilitated through curation. Most of us have a connection to something from our past which we treasure, it may be an object, a letter, a photograph or a memory but it is that piece in our lives that provides us with a link to our individual past. Think of how you would feel if this was then taken from you and that connection to your past was gone. Hopefully this blog has provided our followers with a better understanding of the important role curation plays in the preservation of our heritage. 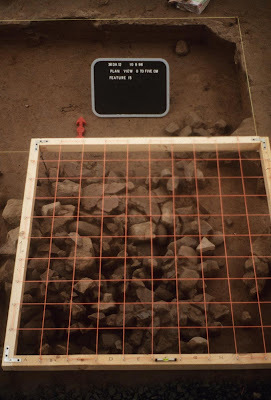 2003 Curating Archaeological Collections: From the Field to the Repository. Archaeologists Toolkit 6, AltaMira Press, Lanham,MD. "B" is for bannerstone, bird stone, boatstone or bola stone; all of which are problematic artifacts. What was their function? This week, the bola stone will be the focus of our "alphabetical archaeology". The bola or bolas is a ropewith a weight attached at the ends. It is a hunting tool often thrown at small game to entangle their feet. Commonly, it has two or three balls generally made of stone, wood or bags of pebbles. Of Spanish origin, bolas were made famous by the South American gauchos. They were also used by Native Americans, notably the Inca and Inuit. Archaeologically, round stones with pecked grooves around the middle have been found across the continent. However, in many references they are identified as either net sinkers of bola stones. Notched net sinkers are very common in the archaeological record of the East and bola stones could have easily functioned as a net sinker. However, why bother to peck the grove when a notched flat stone was the more common form and certainly less labor intensive. The consensus today is that they were either specialized net sinkers or, the favorite, is that they functioned as bolas. In the Middle Atlantic region they are mainly found on Early and Middle Woodland sites (2900 - 1200 BP). At the Faucet site in the Upper Delaware valley, six were found with the early Middle Woodland Bushkill complex (2500 - 2000 BP). 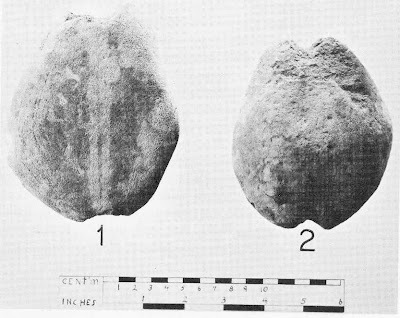 Three were found in close association (representing a three stone bola) with one another and all were found with hunting gear (projectile points, scrapers and knives). W. Fred Kinsey, who excavated the site, concluded they were used along the river to entangle the feet or break the wings of water fowl. Archaeologists rely on the results of controlled excavations to interpret these "problematic" tools left by prehistoric hunters in Pennsylvania to better understand our past. After two years of faithfully blogging every week about artifacts, events and general information about Pennsylvania archaeology that hopefully our readers have found interesting, we at TWIPA are introducing a new series of posts with an alphabetical twist, the ABCs of archaeology. As we continue to cover a wide variety of topics and current happenings in archaeology, interspersed on certain weeks when events are low and creative inspiration lacking, the next letter of the alphabet will be there to keep the ball rolling and carry us through another post. The letter “A” is obviously starting us off, and it’s kind of a no brainer. “A” is for archaeology, of course. And if you’ve been a longtime reader of TWIPA, we’ll spare you the “Archaeology is . . .” speech. We’ve covered that ground pretty well and are confident everybody is on board. And that frees up “A” to be so many other things, like. . .
AMS dating, Archaic Period, atlatal, A horizon, to rattle off a few, but how could we not include that “A” is for arrowhead. And that happens to be a wonderful opportunity to call attention to the fact that the majority of what many people find surface collecting and call arrowheads, are in actuality spear points, or more generally projectile points. Still other types of bifacial tools commonly referred to as arrowheads likely functioned as knives. The bow and arrow, in use by in Pennsylvania the Late Woodland Period, arrives relatively late in the scheme of prehistory around 1000 AD. It is interesting that the bow was first used in Europe at least 12,000 years ago as evidenced from cave paintings. 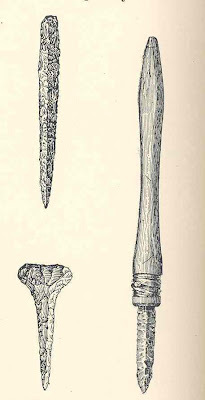 In the Eastern Woodlands, the Levanna and Madison triangular point types are what would have been hafted to the shaft of an arrow. 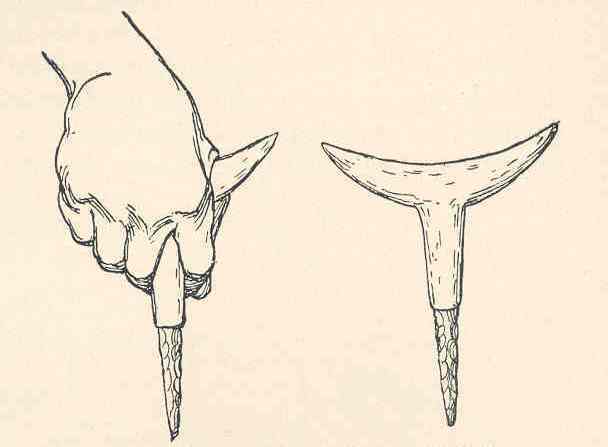 Some have argued that Jacks Reef points are thinner than preceding spear points and also may have been used as arrow points. Seen below is a selection of chert triangle points, followed by a two-tone Jacks Reef point from the study collection at the State Museum. And so with that short laundry list of “A”s, we leave this week with one of the more well used cliques in the field; “A” is for assumption (and we all know what happens when you assume) - just as a quick reminder to keep things scientific, and let the data drive your conclusions, not the other way around.